The combination of the cold wintery weather and me not being a morning person mean that it's practically a necessity for me to have an uplifting and energising shower gel on hand to tempt me out of bed at this time of year. Step forward Lush Happy Hippy Shower Gel. 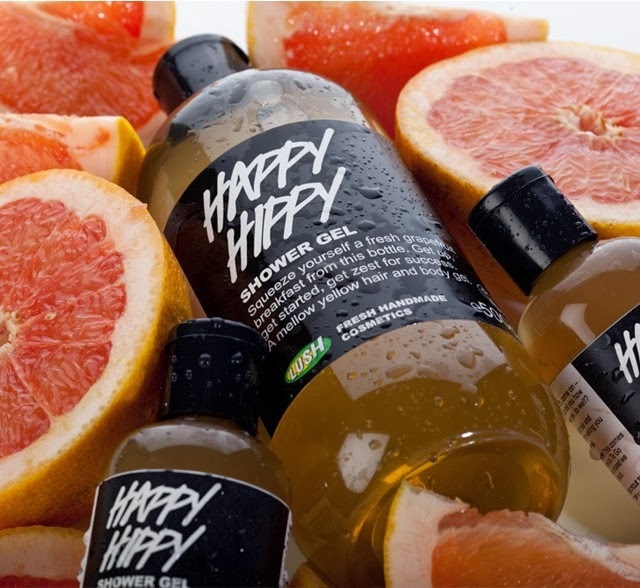 Lush Happy Hippy Shower Gel is presented in a transparent plastic bottle with flip top lid. It's hardly the most luxurious packaging but it's functional- I like that I can see how much product is remaining and the flip top lid makes for easy dispensing when I'm only half awake. The product itself has a pale yellow colour and a slightly jelly like texture. With a high concentration of both fresh pink grapefruit juice and grapefruit water along with grapefruit, bergamot and frankincense oils, it has a very pleasant, fresh citrus scent and ticks all the boxes for having an uplifting and energising effect, making it ideal for mornings. The scent doesn't linger on my skin after use. The only downside is that it contains SLS, albeit in a lower concentration to most shower gels (although it still creates a fairly generous lather), which I find drying on my skin and I certainly can't forgo moisturising when I use this. I really enjoy Lush Happy Hippy Shower Gel and although it's not the cheapest shower gel starting at £3.50 for 100ml, I'd highly recommend it. In fact, I've already repurchased.